"After students choose a program or major, they will choose a morning or evening schedule instead of picking individual courses." Greg Abbott, shown here in May 2018, agreed to a compromise on his campaign vow to require community colleges to employ block scheduling (PHOTO: Amanda Voisard, Austin American-Statesman). By W. Gardner Selby on Thursday, July 19th, 2018 at 3:50 p.m. 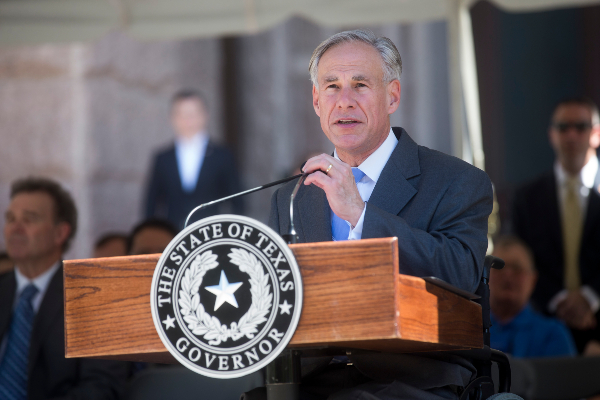 In his first run for governor, Republican Greg Abbott said community college schedules should be made more predictable for the sake of students juggling lives outside the classroom. Abbott suggested in his October 2013 compendium of campaign promises that a law mandating block schedules--requiring classes to take place from 8 a.m. to noon or from 1 p.m. to 5 p.m.--would enable students to balance obligations such as jobs and child care. "Texas," Abbott wrote, "should implement block scheduling for all associate degree programs at junior and community colleges. Each degree, major, or training program should have a built-in, full-time 15-credit-hour-per-semester curriculum. After students choose a program or major, they will choose a morning or evening schedule instead of picking individual courses," Abbott said. With Abbott seeking re-election, we looked into progress on his call to establish block scheduling for two-year associate degree programs by using the Abbott-O-Meter, our method of tracking progress on his many campaign vows. Responding to our inquiry, the Texas Association of Community Colleges told us that the 2015 Legislature advanced into law a proposal requiring certain programs to offer block schedules. Legislative records show that House Bill 1583, which Abbott signed into law June 3, 2015, mandated that by fall 2016, each of the state's junior colleges establish block schedule curriculum for at least five programs in allied health, nursing or career technology that were previously not offered using block schedules. Contrary to what Abbott urged as a candidate, the law does not apply to all community college degree programs. Records show, though, that the initial filed version of the proposal required that courses offered each semester toward all of each community college's associate degree or certificate programs be scheduled in blocks such as morning, full-day, afternoon, evening or weekend schedules, "designed to provide scheduling predictability from semester to semester to students enrolled in the program," the proposal said. Kelly Barnes, an aide to state Rep. Travis Clardy, R-Nacogdoches, HB 1583's author, told us by phone in 2018 that Clardy heeded advice from community colleges in limiting the mandate to classes in allied health, nursing and career technology. At a March 2015 House hearing on the legislation, Richard Rhodes, president/CEO of Austin Community College, testified on behalf of TACC that limiting the mandate for block scheduling to the three areas made sense because "those are areas where students know they're going to be full-time students when they enter." In contrast, Rhodes said, requiring block schedules for all programs "would be difficult" in that most students, many of them going to school part-time, wouldn't be able to accommodate the limited availabilities. We fielded an update in July 2018 by phone from Rex Peebles, an assistant commissioner for the Texas Higher Education Coordinating Board. Peebles said that as of mid-2018, each of the state's 50 community college districts had implemented block scheduling in accord with the law. Peebles said the board was gauging whether the changes resulted in more students taking more courses to complete more programs. We rate this previously unrated Abbott promise a COMPROMISE. Compromise — Promises will earn this rating when they accomplish substantially less than the original statement but when there is still a significant accomplishment that is consistent with the goal of the original promise.